Judas knew where to find Jesus; Jesus took his disciples there many times to pray and be with them. Unfortunately, Satan still uses people close to God's children to wound and betray them in places where they feel they should be safe. That reality makes the wound all the more grievous and the methods of betrayal all the more harsh and garish. The very acts of betrayal seem to defile the once holy places. We must recognize, however, that betrayal — no matter the place where it occurs or the people who are involved — is not the fundamental problem. Satan is! 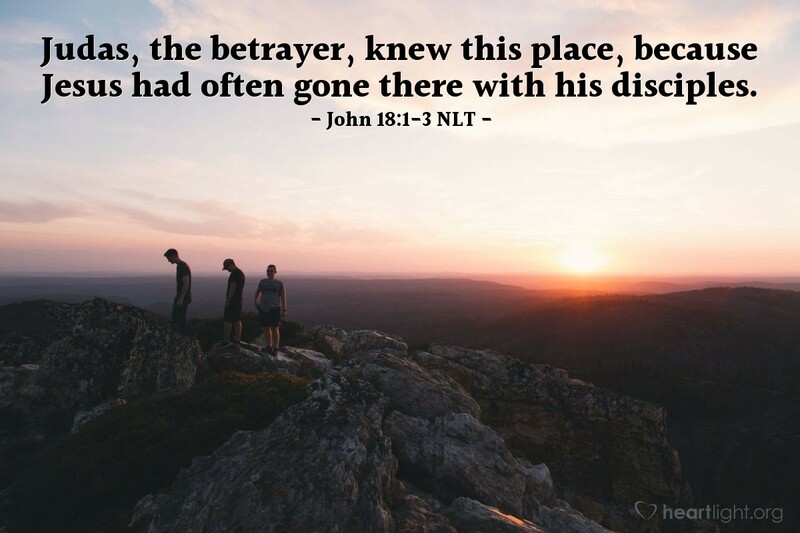 Since Jesus was betrayed by one close to him, we should not expect things to be all that different for us. But, we must not let that possibility keep us from God's people or God's places! If Satan can keep us from Jesus' disciples and the place of prayer and fellowship, then he has us just where he wants us. Don't let the unfaithfulness of others drive you from the people of God! Father, give me strength and courage never to let the ruthless and duplicitous actions of others drive me from your people or the places I need to go for strength, encouragement, and support. Jesus, please come to me and minister to my broken spirit in times like these. Amen.